Description: This is a large world illuminated globe with 1 window (hole) in each country. The globe spins within a grey outer ring that has a movable view finder that children can use to look in to each window to see capitals, landmarks, facts, etc. The globe includes 120 different slides of information waiting to be discovered by children. The globe is illuminated by a light inside. Operating instructions and a 25-page referance book are included. UL listed. Designed for children ages 6 years and older (1991 catalogue lists this set was being designed for children ages 5 years and older. FPT45027 - Small rectangular 25-page reference booklet. 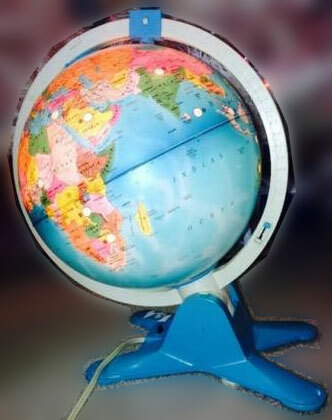 1988-1990 - This globe was sold in a 14-11/16" long, 18-7/8" high, 14-11/16" deep box. 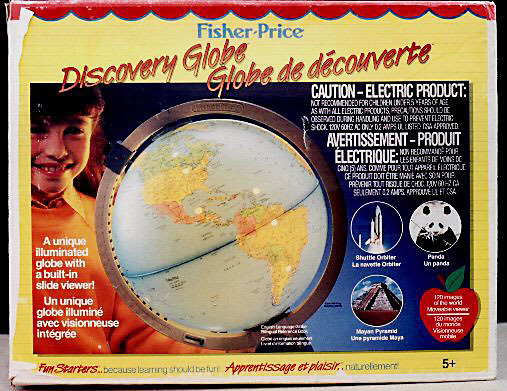 1991 - This globe was sold in a 18-3/4" long, 14-5/8" high, 12-1/4" deep box.